Its charming location and the almost un-Dutch atmosphere means Westerveld is often chosen as a site for television and film recordings. Numerous TV producers and film-makers have chosen, and continue to choose, Westerveld as the location for their productions. For instance, the fourth season of Penoza, a successful Dutch crime series, was recently recorded at Westerveld. Recordings were made at various locations in the memorial park. This was not the first time that the cast of this popular series visited Westerveld. Thanks to its monumental appearance, the beautiful lanes and hilly landscape and serene tranquillity, the memorial park was chosen three times before. 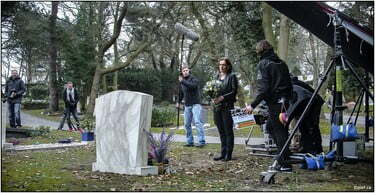 The series features the best Dutch actors and actresses, including Monic Hendrickx (Carmen van Walraven) in the lead. The fourth season of this popular TV series will be broadcast in the autumn of 2015.